During our diner-ing, we ended up with many more photos than will ever be published, and we wanted to share some of them with you. 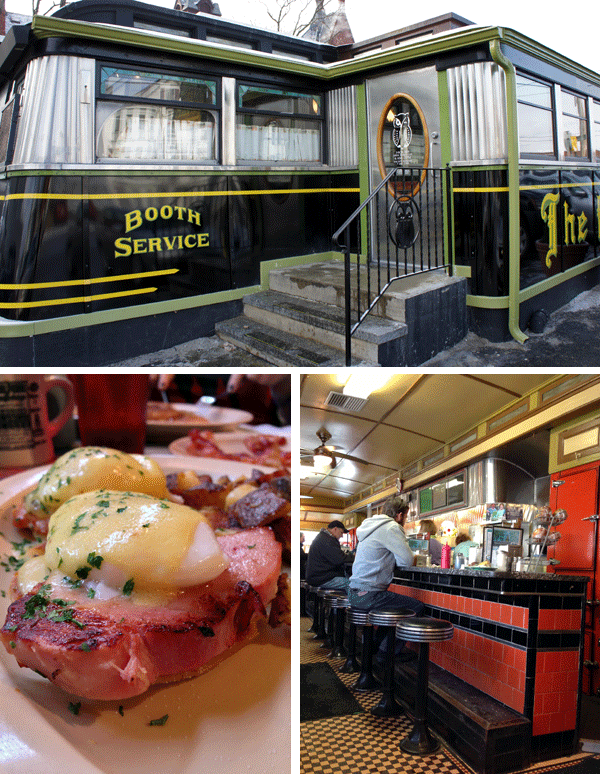 We haven’t made it to every diner in every town (yet), but here is a pictorial tour of a handful of fun places to try for your next road trip or weekend breakfast. 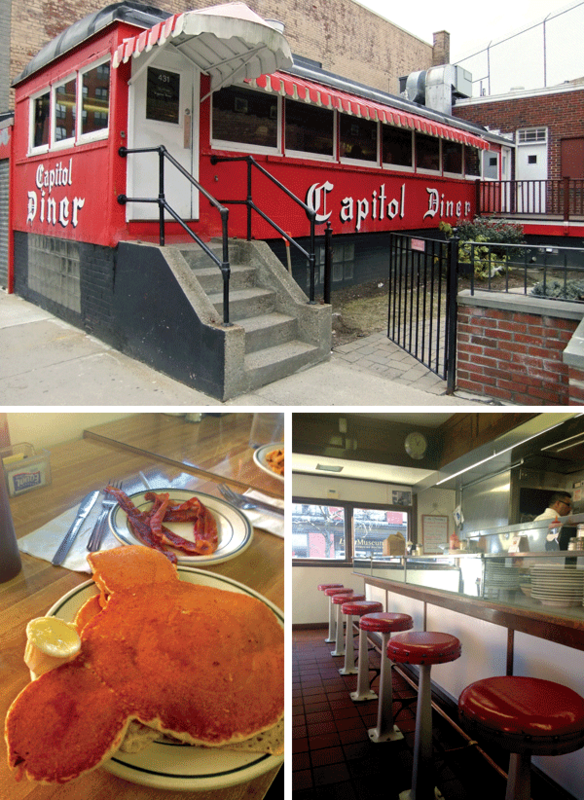 The Capitol Diner in Lynn has been serving up specialties since the late 1920s, but we’re betting the Mickey-shaped pancakes are a newer addition. 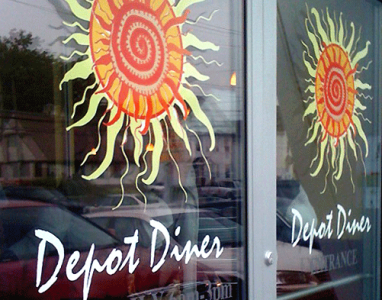 New owners Ross and Alicia Scanlon have made the Little Depot Diner a hit by bringing in new energy and maintaining old favorites. 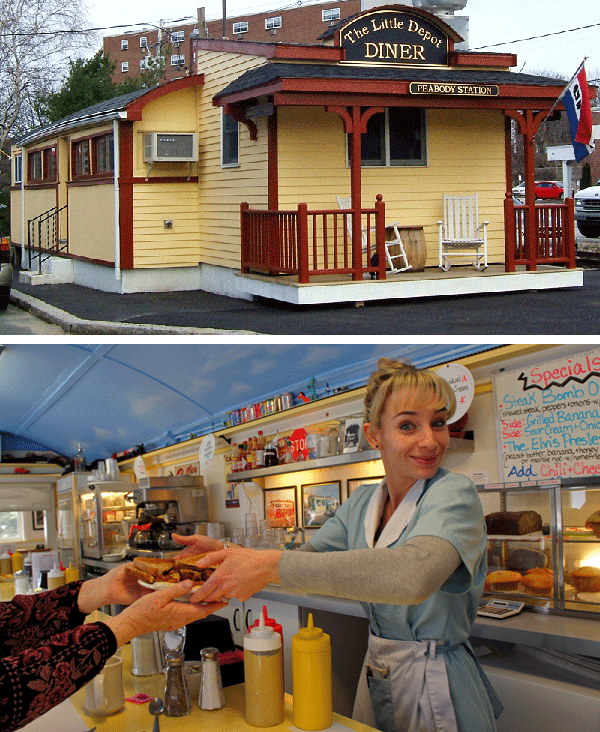 Lowell’s Four Sisters Owl Diner sports a newly renovated entrance and a cheery vintage interior. 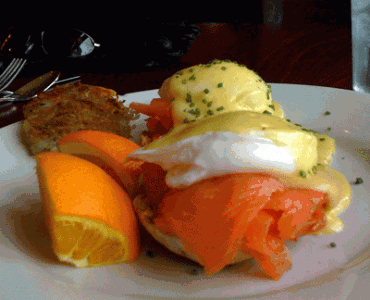 The Eggs Benedict is amazing. 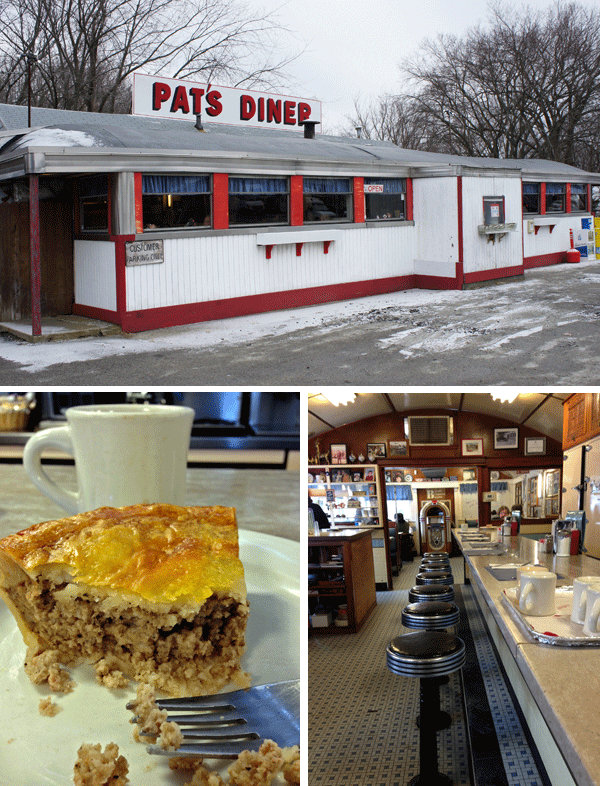 The summer beach crowd is familiar with Pat’s Diner in Salisbury, but it was quiet on a winter afternoon. We enjoyed the unusual pork pie. 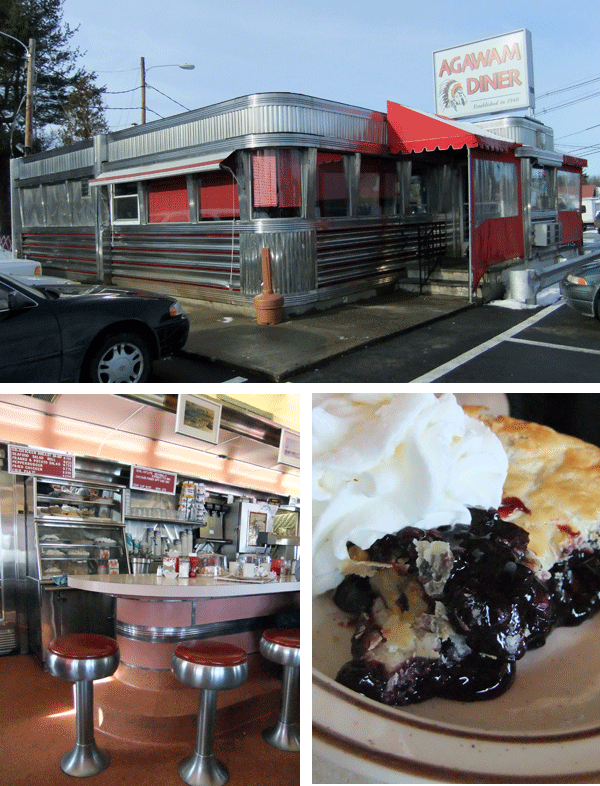 Pie is the thing at the Agawam Diner, and they always have an array of beautiful desserts on offer. 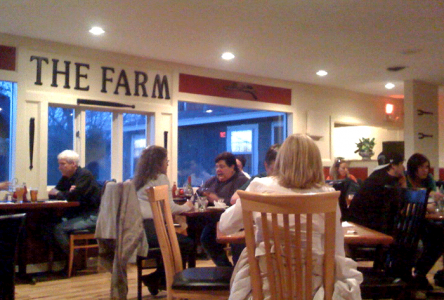 Crowds convene at all hours for hearty meals and a cup o’ joe along with their favorite slice. 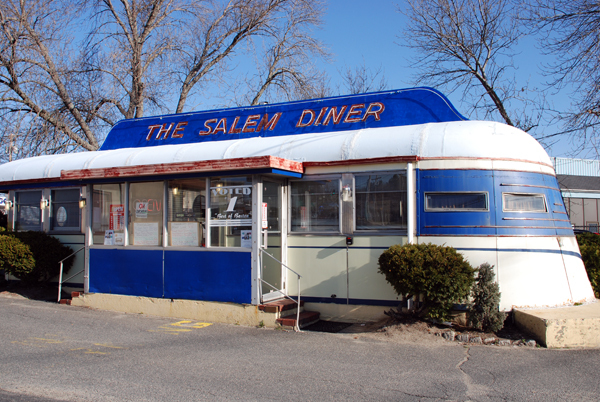 And lastly, a special photo of the Salem Diner, which was taken in 2008. This is our favorite shot as it shows the old neon as it was, before the diner suffered damage in a fire. 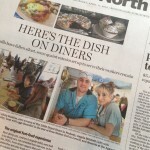 The diner has been renovated, and George and Zoe Elefteriadis serve up great breakfasts, but we do miss the neon. 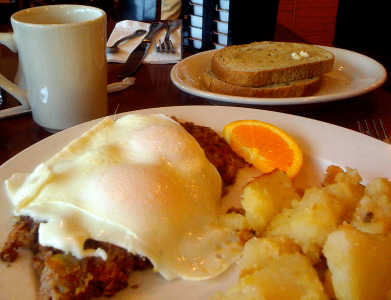 Extraordinarily for us, last weekend saw not one but two brunches, both in Beverly. On Saturday, we had relatives staying who wanted to go to brunch, and our favorite Wellesley student is vegan, so we let her choose the venue. 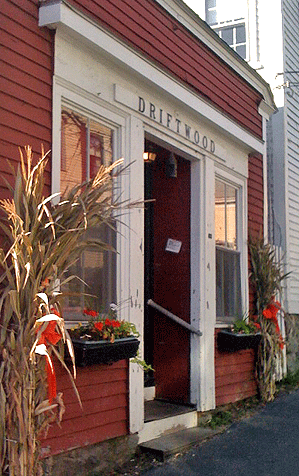 She decided on The Organic Garden Café on Cabot Street, which not only serves vegetarian and vegan fare but largely raw foods as well. The space is small and comfortable, and our waiter was attentive. We were offered both the breakfast and lunch menus and chose items from both, sipping our drinks while we waited for the food. The coffee was respectable; the hot cocoa, made from raw cacao, was super rich; but my favorite was the lemon ginger and raw honey tea. Blended fresh, it arrived frothy and hot and was a perfect antidote for winter weariness. Our entrees ranged from “live”(dehydrated instead of baked) granola ($6) and quinoa porridge with agave nectar, cinnamon, cardamom, and raisins ($4 with additional toppings $1 each) to the Southwestern faux omelet on baby spinach ($7), made with a combination of ground nuts and veggies in lieu of eggs. We also tried the omelet, nausage patty, & crepe combo ($9) where a mix of sunflower seeds, flax, onion, portabella, and seasonings stand in for the sausage. 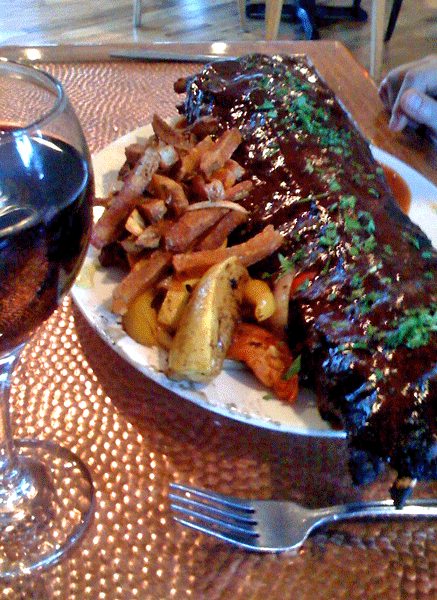 Clearly, the faux versions of traditional meat items are not meant to replicate the carnivore’s experience; they are fanciful takes using similarly spiced or textured food. Everything was extremely fresh tasting and well seasoned, and in the end, the savory foods with their layers of flavor won out over the sweet; the southwestern plate being a real standout. The large case displaying great-looking desserts was enticing, but we were so sated that we opted to purchase a few treats to take home for later. Eschewing the cakes and cookies, we had to try the “I am Mighty” balls ($3.50) for the name alone. A dense combination of fruits, nuts, and seeds dipped in dark chocolate; it was like the ultimate protein bar—tasty, satisfying, and energizing. The menu mentions that eggs are local, but isn’t specific as to the source. The omelet was huge, and the vegetables tender but a bit heavy on the peppers. The benedicts were lovely, with velvety lemon hollandaise and excellent quality smoked salmon. Each plate included a portion of hash browns and two huge orange wedges. 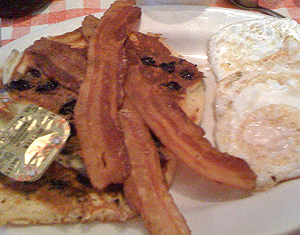 The hash browns seemed an oddity; a small, dry half-patty that I wanted to be tastier than it was. The weekend turned out to be a lesson in expectations. 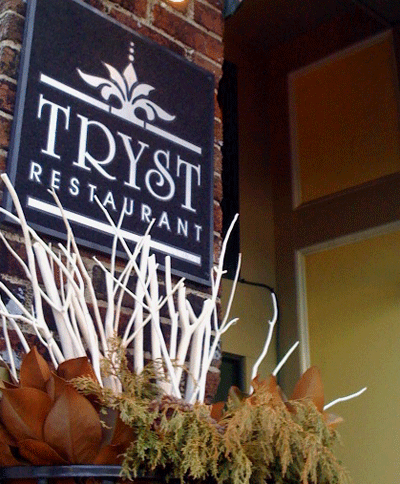 Having had lovely dinners at Tryst and heard good things about their brunch, our expectations were high. The meal was certainly tasty but didn’t knock our socks off. It’s a solid choice for those seeking a good brunch in a nice room (not as common as you’d think on the North Shore), but in future, we’ll stick to Manhattans and roast chicken at the bar. 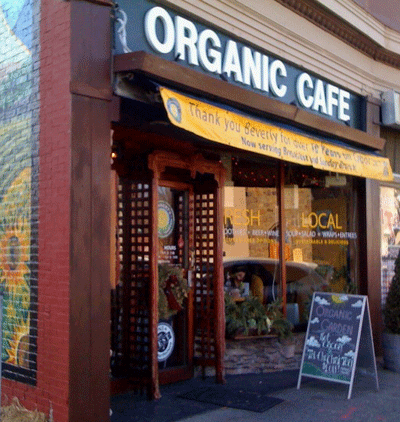 My only assumption about Organic Gardrn Café was it likely had a “hippy-crunchy” vibe, which it did, though not oppressively so. The opportunity to sample foods I had never contemplated making at home made it very enjoyable. What fascinated me was not the raw aspect of the food, but the creative combination of textures and tastes. I found myself thinking about returning for lunch or dinner to explore more menu items. 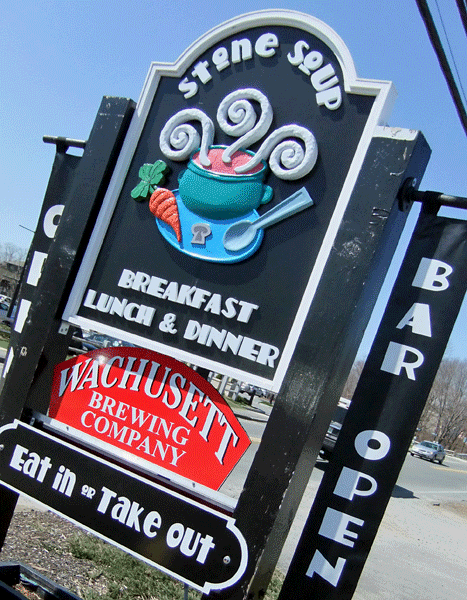 We had heard good things about Stone Soup Café in Ipswich, so when we found ourselves in the area and in need of nourishment last week, we stopped in. Good thing we were hungry—this place serves up a serious lunch. The menu is large and includes salads, burgers, dogs, roll ups, specialty sandwiches like grilled cheese and avocado, fried chicken and fish, plus pizzas with gourmet toppings and a selection of house-made soups. Breakfast items for lunch are a favorite of ours, so we were thrilled to see not only pancakes ($4 for one, $6 for two—and they’re huge) and eggs benedict ($8), but a monster egg sandwich ($7). It lived up to its name: after a cup of excellent spicy lentil soup with sausage ($3), we had to take half of this delicious grilled sandwich home. 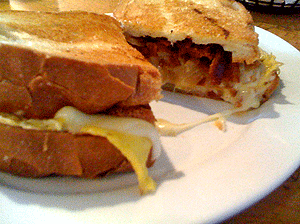 It featured fried eggs, hash browns, bacon, cheese and sautéed onions. 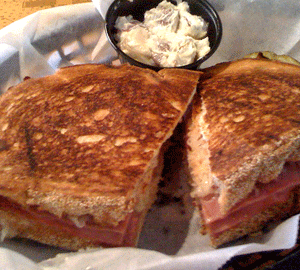 We also sampled a cup of clam chowder (creamy and full flavored, $3.50) and a reuben filled with pastrami and sauerkraut on grilled bread with melted cheese ($8). And yes, we took half of that home as well. The service was attentive and friendly, even going so far as to bring us a sample of the lentil soup so we could judge the spice level. The décor is less pleasing; it looks like not much has been done since the restaurant moved from its downtown Ipswich location last spring into what had been Marco Polo, an Italian restaurant. Stone Soup serves breakfast and lunch every day as well as dinner Thursday to Sunday, with entrees ranging from $9 to $17. A full bar is available for lunch and dinner, including beer from Wachusett Brewing Company in Westminster. 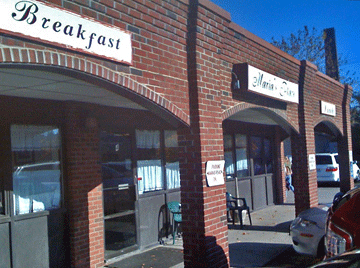 A reader e-mailed us a few weeks ago to recommend a couple of restaurants in Lynn, and this long weekend was the perfect time to check out one of them: Mildred’s Corner Café. Boy, are we glad we did. 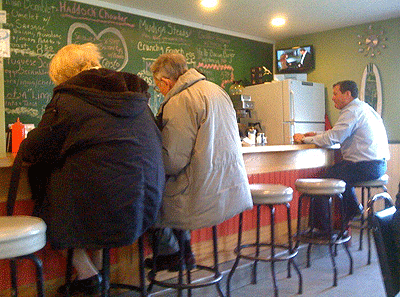 Mildred’s is a charming spot with creative breakfast and lunch offerings, kitschy Hollywood décor, games to play while waiting for your food, and warm, attentive service. The tiny seven-year-old café, which is only open Friday to Sunday, is clearly a labor of love by Jan McLaughlin-Muirhead, who describes herself owner, cook, waitress, chief dishwasher on the menu. We had been seated for approximately five seconds before being offered coffee, which came in large, colorful mugs. Tea is also available—19 types of loose tea, a fact that surprised and delighted us. After studying the menu and relaying our choices, we sat back to admire the movie-star posters and test our knowledge of silver-screen trivia. 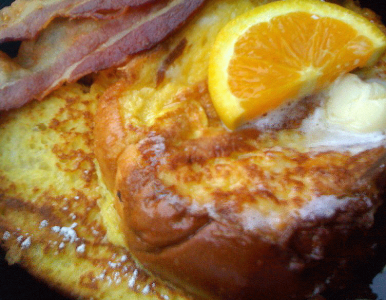 Along with the usual breakfast offerings like omelets and French toast, Mildred’s large menu has seasonal specialties like pumpkin pancakes, gourmet items like a wild mushroom omelets, and light fare in the form of fat free yogurt with granola and fresh fruit. We tried the crabcakes benedict ($11), which came with a generous portion of both hollandaise sauce and home fries. Everything was well seasoned and tasty, although the potatoes could have been more crisp. We also enjoyed the English breakfast ($6), featuring a small cup of baked beans, two delicious sausage patties, and grilled tomato slices along with fried eggs. The huevos rancheros ($9) was a winner, combining flavorful refried beans with large chunks of sautéed tomatoes/peppers/onions, a generous scatter of ripe avocado, and two fried eggs. The junior member of our party declared her crispy bacon the best she’d ever had, enjoying it along with her scrambled eggs, pancake, and Go-gurt ($5). It was a great way to start off a Sunday, and we look forward to returning to explore more breakfast items and interesting-sounding sandwiches like the avocado egg salad. We hear that there is often a wait for tables, so we were glad to see a small counter with stools as well as a separate waiting area with couches and a television playing (you guessed it) classic movies. 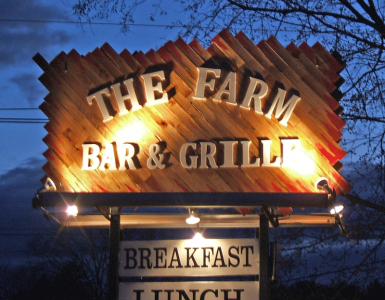 There is no shortage of great places to grab breakfast on the North Shore, and we’ve got another one to add to your list. On Sunday morning, we stopped by Maria’s Place in Salem for carbs and caffeine to jumpstart our day. Set at the end of a strip of storefronts on Jefferson Ave., the dining room is large and open, giving it a sort-of cafeteria feel, with a counter and grill along one wall. The atmosphere is warm and friendly, with locals chatting up the kitchen staff and waitresses calling out “See you next week” to regulars. We were greeted and seated right away, our helpful server promptly filling our coffee cups. The menu featured all the usual suspects, and we had a hard time choosing, so we decided to order several things to share. 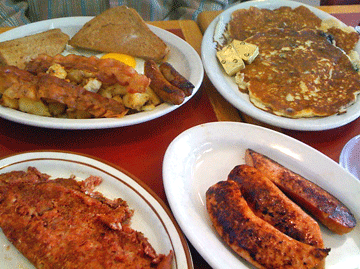 The first was the popular hungry man breakfast, which includes two eggs, sausage, bacon, homefries, toast, two pancakes, and a glass of juice for $9. The menu warns there are no substitutions, but for a $1 more we had the blueberry pancakes in lieu of plain. It turned out to be a huge amount of food, and while the homefries were ordinary, the blueberry pancakes were excellent: large, nicely browned, and full of flavor. We also ordered the Belgian waffle ($6), along with sides of corned beef hash and grilled kielbasa, an unusual addition to the menu ($3.75 each), While it tasted fine, the corned beef hash was too finely ground; we prefer larger chunks of meat and potatoes. 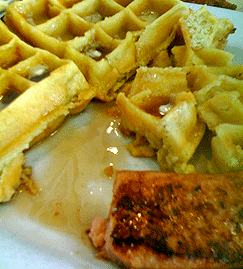 The waffle was quite respectable, and one taste of the kielbasa made us glad we had ordered it. Salty and savory, it was a welcome change from the usual side dishes. Although Maria’s Place is bright and clean with terrific service, it somehow lacks the charm of local diners or places like Red’s and The Driftwood. Still, if charm’s not your thing and you’re looking for a no-nonsense friendly place for a solid breakfast, look no further. Maria’s is open 6:00-3:00 Monday through Saturday and 7:00-2:00 on Sunday. It also features an extensive lunch menu.